Kino Sydney returns with your monthly dose of short cinema (+ pizza + Q&As + giveaways + live music). Come and cheer on as first-time filmmakers, Sydney favourites, and seasoned pros, strut their stuff and premiere their new short films. Tickets are $10. All ticket holders get: access to theatre for inventive short films and filmmaker Q&As, live music, pizza, opportunities to network, and the chance to win prizes. Buy tickets now and RSVP on Facebook. 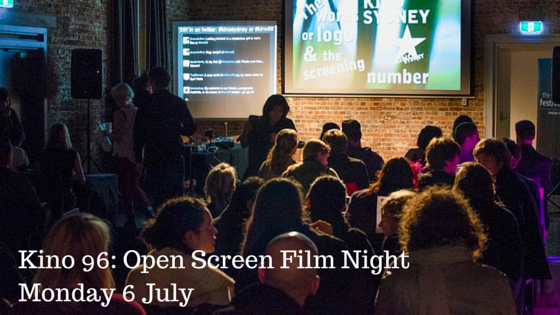 Filmmakers: Kino Sydney is city’s only open-screen film night. Register now to book your slot and free access to the screening party (spots go quickly). You have two options: open-screen or curated. Open Screen: Films must be under 5 minutes, have Kino Sydney and screening number in credits, must be world premieres, must not be home videos, and must not be advertisements. Curated: Film must be under 10 minutes and the filmmaker must be new to Kino Sydney. We only curate one film per month and need a link to the film submitted. This your opportunity to introduce yourself to the Kino Sydney community.